In 1955, Jenny Van Horne was a 21-year-old, naïve Bennington College graduate on her own for the first time in New York City when she met 46-year-old Clement Greenberg who, she is told, is “the most famous, the most important, art critic in the world” and soon finds herself swept into his world and the heady company of Hans Hofmann, Willem de Kooning, Franz Kline, David Smith, Helen Frankenthaler, among others. Seven months later, as a new bride, Jenny and Clem spend the summer in East Hampton near Jackson Pollock and Lee Krasner, and she feels even more keenly like an interloper in the inner circle of the art scene. A woman disowned by her anti-Semitic family for marrying a Jew, she would develop a deep, loving bond with Clem that would remain strong through years of an open marriage and separate residences. This book had lovely moments but the subject matter was not something that I found myself incredibly interested in. 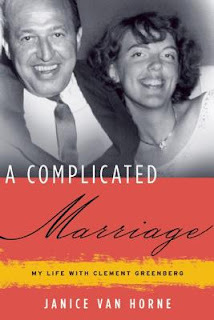 The courtship between Janice and Clem Greenberg was the section I enjoyed reading the most. They were 20 years apart in age and miles apart in experience. Janice's family was less than thrilled about their daughter marrying an older, Jewish man. Towards the middle of this book I found myself skimming. The author details her thoughts on a smattering of artistic couples/individuals. If you have an interest in the art world of the 50's and 60's this could be amusing. Unfortunately, I rarely recognized the names. A better explanation of who these people were would have given the book a big boost. A Complicated Marriage did pick up some steam towards the end. Janice and Clem had an open marriage that was intriguing to read about. The most gratifying? Reading about how Janice came into her own. While well written, and full of information, this book didn't speak to me as a reader. JANICE VAN HORNE was born in New York City and raised in the suburb of Rye. She graduated from Bennington College in 1955 and moved to New York where she met and married the well-known art writer, Clement Greenberg, in 1956. After their daughter was born, Janice began her career path in the 1960s as an actress, performing with a multitude of the OOB theaters and performance groups of that time, and studying with the renowned Lee Strasberg at the Actors Studio. 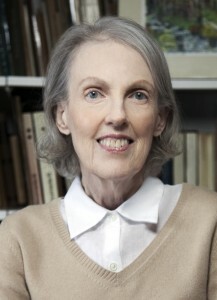 In 1974 she co-founded and was editor-in-chief of the successful Madison Avenue Magazine. Later, in the 1980s, she returned to the theater, this time as a playwright. Her work has been seen in many productions, primarily in Los Angeles and New York. I'm not normally a big fan of autobiographies. I think it might be because the authors are too close to the stories and I like reading more objectively about interesting lives. This does sound like a good read for those who are interested in the art scene of that time, though. Thanks for the review. I went through a phase of biographies and autobios when I was a teen. Now that I'm a bit (ha ha) older I tend to agree with you. I like a bit of distance in my nonfiction. I just won this in a giveaway from Allison at the Book Wheel. I'm also intrigued by the subject matter—of course I'm an artsy fartsy nerd so maybe it'll be a better read for me?? Looking forward to it! I hope you dig it Kristin. It could very well appeal to your artsy fartsyness, lol. I totally agree, a quick who's who would have really helped! Right! I think the gossip would have been a lot more interesting if I had known who some of the people were. Meh. Doesn't seem like my cup. It was well written but I couldn't find that connection that I need. I think I am going to have to read it. I know a fair bit about art in the 50s and 60s and have read a lot of Greenberg. You say it is well written. I was worried that it would get bogged down in intellectualism. The book as a whole sounds okay but yes, not particularly accessible unless you already know that world. I suppose if she's famous in that world (I don't know) it might work. I do think that people of that world would really like this book. Sadly, I'm not of that world. Nor do I really know much about it at all. I'd like to see how they met and fell in love and how they managed their open marriage, and of course how she comes into her own. Sounds like a fascinating read, regardless! A lot of the time it sounded to me as if she was just going along on the ride that her husband wanted to take. I'm also not a fan of the whole story about a couple thing usually. No offense to the couple, but unless you were super exciting, I get kind of bored. I do like the idea of reading about an open marriage, since that sounds interesting. But if you skimmed this book at points, I'll probably skip it. Hmm, well, then - I'm not sure even the relationship would have worked for me. It would take some book to make me understand how people could be happy in an open marriage when they don't even live together and are so far apart in age. It doesn't sound like this is a book that could do that. Rethinking whether or not I want to read this one now. Read another review which sparked my interest, but your usual honesty brings to light something that would bug me -- not having enough background in art to put names and faces together in the artsy section. It's a tough call. There are interesting aspects to this but it didn't spark my curiosity like I had hoped. There are definitely interesting aspects to this book. I think I'd be drawn to the same parts you enjoyed. I found many interesting tidbits in this. If only I was more knowledgeable about the art world, I think I would have liked this a lot more. You have to be honest, right? ;) Even though it's not easy! I'm happy to see that you enjoyed the ending even though the rest of the book wasn't exactly your cup of tea. Ah, I probably wouldn't enjoy it that much, either...except for the in-depth parts of the relationship. Thanks for sharing.